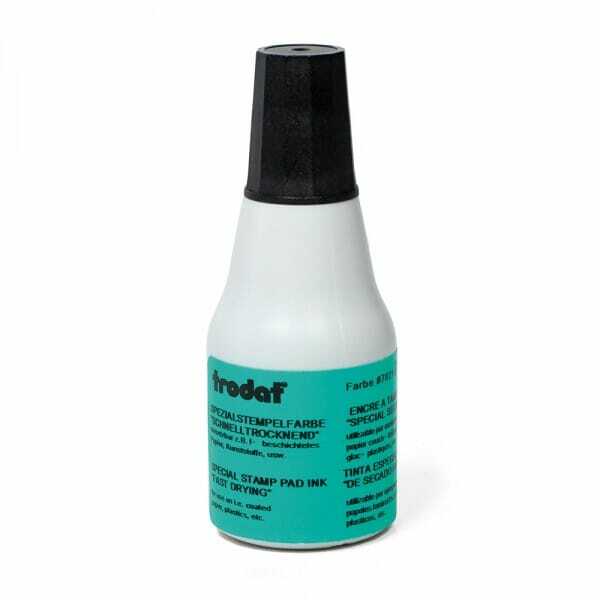 Trodat stamp inks are specially developed for the modern stamp market's most varied demands. 7021 Quick-Dry ink is applied to traditional felt ink pads. For use on semi-porous and non-pourous (glossy) surfaces such as catalogs, brochures, business cards, photos, frequent buyer club cards and similiar. The color can of course also be used on porous surfaces like paper, card stock, cardboard, etc.. It usually dries in 1 to 2 minutes on semi-porous and non-porous surfaces and almost instant dry time on porous surfaces. 25 ml bottle of ink. Suitable for all brands of re-inkable stamp pads. Available in following colors: black, blue, red, green, violet and white. Customer evaluation "Trodat 7021 Quick-Dry Ink"